As a content marketer how do you work? What if there was a slightly better way to give you a bit of an edge to rank in the top 10? Would you want to find out about a product which can help you get there? How will Web Content Studio software help you? What has Web Content Studio got inside that has got me so excited? With every website you have loads of articles, so you need to keep them organised. With this software you get a basic project manager. 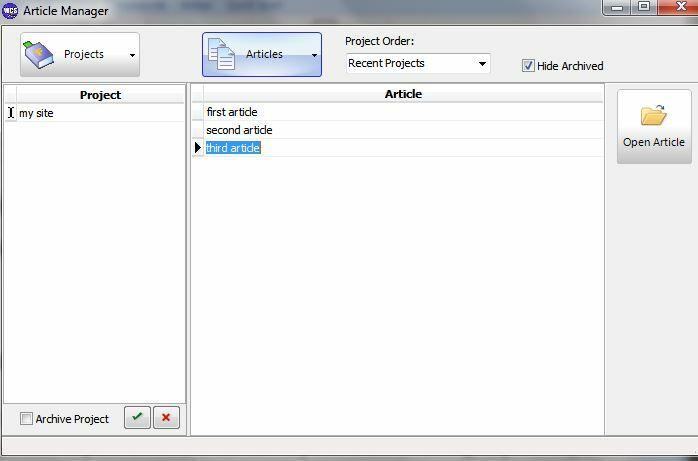 You can enter the project name and then add articles to the project. The name of the article is not the title of the article so you can name it something sensible. Once you have opened an article, you see a notes tab. The notes are specific to the project, so you can include things to do, look up or anything related to that project. Clicking on the editor you are in the wysiwyg editor. The WYSIWYG ( what you see is what you get) editor is where you will write your article. the results will be empty. If you have a style which you use to write your articles then you can save it for future use. This is located second to the left of the update word count across the top. Headings, paragraphs, highlighting text, test colour, all of the standard editing functions you find in your wordpress editor are here. It just seems a little easier to use somehow. Clicking on a section of text, you see a box around it – any formatting you apply will be applied to all of the text within the box. So you don’t need to highlight the test to make it a h3, just click in the box and drop the normal box down to a h3, done. Your article is auto saved every 5 minutes from the start – this can be changed under the options ->autosave menu. You have an auto spell checker constantly running in the background, this can be customised to suit the language you are writing your article in. There are a number of languages available for download at the addictive software dictionary site. the last icon (treeview) at the top is a very useful one. Clicking on this brings up a panel showing a treeview of your article headers. From this you can see at a glance if the headers flow and are capable of stopping people to read the rest of that section. Clicking on the header will take the editor to that section. So if you are using a template you can jump between section editing your article, or write down your headers and see what the article will look like. 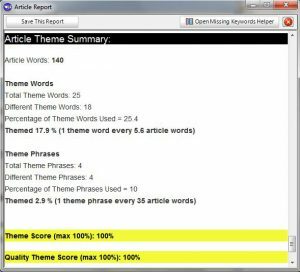 The other part of that panel – the search – is very useful when you have finished the article and have checked the theme report. It allows you to locate words, nothing special, but it also shows you the words around it. So you can preview the context. If you have overused theme words you can skim down the list of where they are and decide which ones to change quickly. The only problem I see with this is that the first instance is highlighted, if there are more than one in the preview section this is not highlighted. If you have done some research and it is on the research tab editor then you can have this as a floating panel to assist you while writing your article. Getting your finished article onto your site is easy – you can export it as HTML or plain text ( although this option does remove all formatting so you will need to go back in and add headers etc) to a file, to the clipboard. 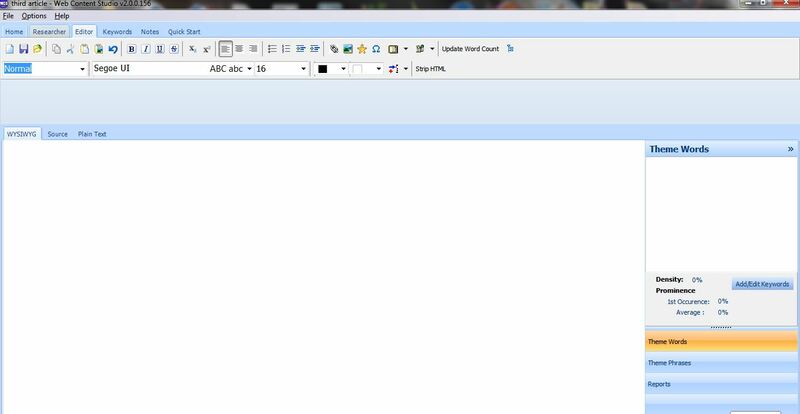 From here you can paste into your wordpress editor in text mode and see your article with all of the headers and other formatting. One of the main timesavers in this software is the keyword spider. Ok so you may already be looking a page one of google to see who is there and reading their article to say ‘ I can do better than that’, but are you seeing their keywords? but are you looking at the top 10. Are you confused by google returning results without the keyword in the title. How are they being ranked- what relevance do they have with your keyword. This is where the keyword spider comes in. After entering your keyword into the box at the top, you press on the spider button. Wait for the spider to do its work. Which is to go away and find the number of pages from the google you specify, doesn’t have to be google.com but will only work with alphanumeric characters. Adding other googles to the list is an easy task. 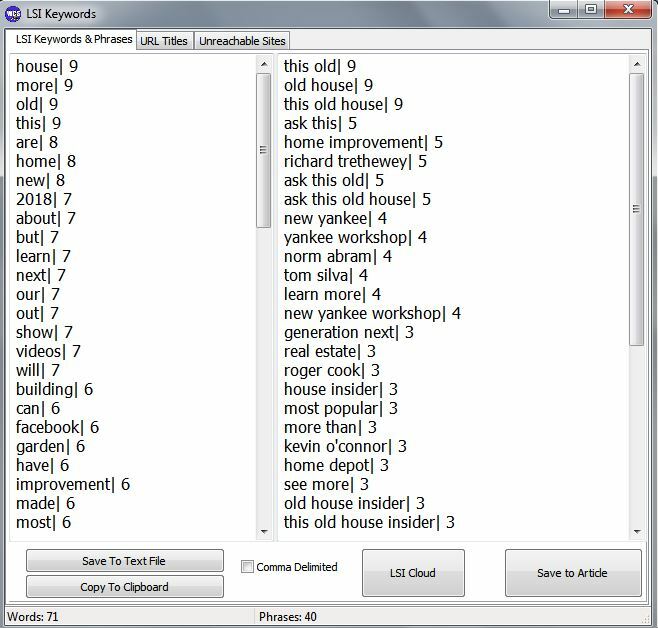 Once it has copied the top 10 ( default) it will look at your keyword and find all of the similar words, two, three and four word phrases linking the pages together. most relevant for the keyword. hence the reason these pages are at the top. You can add shopping sites and sites to ignore within this panel. Before you click on the spider you can add temporary sites to ignore – so if you know that Amazon will come up in your search on the first page then you may want the content of this page ignored- so add it to the list – the spider will then use the first 11 results with the Amazon one ignored. You can also, if you know sites which you want to beat, load up a list from a file. This way you know which sites are being crawled. Once the spider returns its results, which does take a minute or two you have two panes which includes the theme words and the theme phrases. You can review these and delete any words not relevant ( some which you see all the time – add them to the ignorelist), keeping key words and phrases for the topic you are going to write the article about. 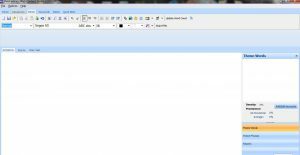 Once you have finished you can save them to a text file as a list, a csv file or copy them to the clipboard. Using it in this way you can send the list to a writer as words you want included within an article. You can easily send the words and phrases to the built in editor and the panel of theme words and phrases will be populated. you can now write your article with the theme words and phrases open for reference. You can view the list of sites that the spider has used and any which are not available or you don’t want the results skewed by forums now is your chance to add them to the temporary ignore list and run the spider again. Before you have run the spider you can go to sites and start your research. Opening the researcher panel and clicking on the grabber button anything you copy will appear on the researcher panel. So this could be websites, pdfs, word docs, any text you can highlight and copy will appear on this panel. It saves you time as you don’t need to paste the information onto the page. You can setup headings on this page. wherever the cursor is flashing this is where the text will be pasted, so moving the cursor under a different heading will paste the text there. Once you have finished clicking on the stop grabber will end that session. All of the data on there you can send to a note for the project, or append to a note already there. You can post process the data removing parts you don’t need easily. The panel can be opened when you are in the editor by clicking on the star icon – this stays on top until closed. This section of the editor is very powerful. 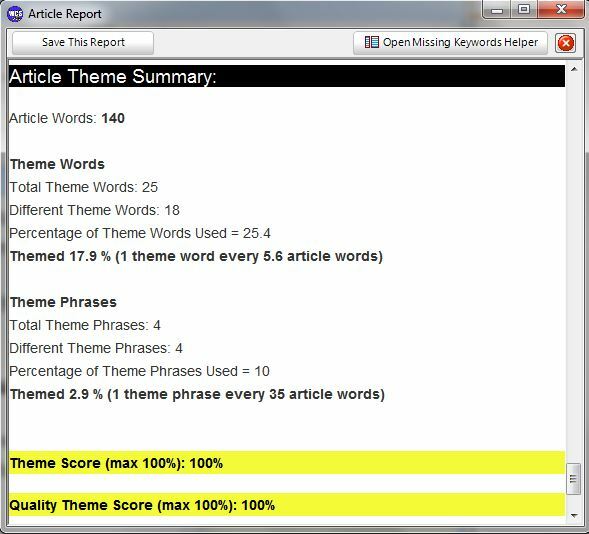 You are shown a report with the number of occurrences and more importantly any missing theme words and phrases. I use this as a quick look as the report at the bottom can show you more. The keyword map displays your content with yellow theme word overlay along with blue theme phrase overlay. You can see the distribution of the theme words and phrases and any section missing any colour you can go back and edit to add theme words. The theme report shows similar information to the keyword report, but goes a couple of steps beyond. In the option menu you can setup the density of the theme words and phrases. Any which are over this are shown within this report. So using the search function within the editor you can now easily go back and look at where you have used them and see if any can be changed without losing too much meaning. 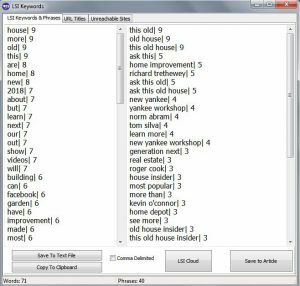 You can try this report with the exact match ticked, this will reduce the number of word uses to the exact ones rather than embedded ones – so word appears in words and keywords. But if you use the exact match neither would be counted. You can get a panel with the missing theme words and phrases for you to go back and see if you can include them within your article. At the bottom of the report is a summary of your article. Showing how many words, the number of theme words, the different theme words and the percentage of theme words used. You can compare your results to the top results within google by using the last button in this panel. Entering your keyword allows the software to go away and download the top pages and give you a score for each of these pages, similar to the result above. You can now see how your article compares to these percentage wise and whether you need to do any tweaking. What can the software do for you? Every time you want to create an article then you add it to your project. Every time you have an idea for a project you can add another note to that project. Every time you want to rank for a keyword – use the keyword spider to get the theme words and phrases Google is looking for in top quality content. Check what you have written against the theme list to make sure you are using all the right words. Give you an overview of your content to see the flow. Help you to carry out research easily. 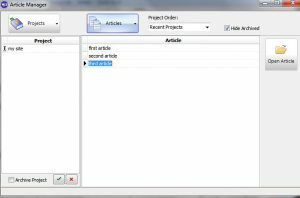 Create templates to keep you articles looking the same. Once you are used to the concept of themeing ( yeah I know it looks like it is spelt wrong). Then you can very quickly research, get theme words and phrases, write the article and check it. Saving you loads of time. All contained within this software, and the fact that the author, Andy Williams, uses this software to create his articles shows you something. Andy has been in the SEO business for over twenty years and has developed this software to help him create quality ranked articles. So if he uses it I want to too. If you find a problem a simple email to Andy will get a very quick response. I found a little problem with creating the word clouds and that was sorted within 24 hours of reporting it. There are a few little niggles. One which is the manual update, you need to remember to click it whenever you start the program. It would be nice for the keyword to be included with the article, so when you click on the top 10 check you are not asked for your keyword. But this would probably be difficult to achieve. Once the spider is going there is no stopping it, to update the ignore list you need to wait for the full cycle. Update: I emailed Andy with a suggestion to add a cancel button once the spider was started to allow a look at the used websites and it hs been implemented , less than 24 hours after the request- thanks Andy. The included pdf help file is well out of date, but there are videos online – either on this site or on his you tube channel of how to use it. Is LSI still important in 2018? find out as Andy talks about it in his video. Would I recommend this software – YES. Why would I recommend it – it will save you a lot of time analyzing the top 10, it will help you write your articles with themed content to help you rank. The list could go on. With the 60 day no quibble guarantee and superb support – I don’t see any other way I would work now. If you are serious about ranking at the top consistently then this software is a must. It sounds great! Especially the keyword Spider which I think I’ll love! I’m a beginner, though. I started my blog not even two months ago. Even though I work a lot on my site, I’m pretty sure I’m considered still a beginner. Would you recommend Web Content Studio for beginners? Hi Jenny, thanks for dropping by. As you say the spider is an absolutely fantastic tool to get LSI keywords to use in your content. I seriously would advise anyone at any stage, if they are not using this technique, to get this software – or start using this technique. Even if you just copy your content into the editor and check it against the theme word list – like you would with an external writer, you will gain massive benefits. It will give you so much of an advantage over your competition that you will not believe. This post, for example, ended up on page one for the keyword i went for. This site only has a few articles on it. The competition score in a keyword tool was over 100, so that shows you how much of an advantage this tool will give you. Yes it means spending a little on yuor business, but it is a one off price and upgrades are free. There is also a monthly price if interested. But investing in valuable tools to assist you build your business will pay off in the future. I would certainly recommend web content studio to a beginner and recommend reading about themed content to take your site to the next level. Waow! This sounds amazing and very tempting, hardly do you ever see these products delivering what they say, but am glad to hear this one does. Will look into it though. So how much does it go for. Scanned through a few times again but dont think i saw the cost. Hi Queen, thanks for dropping by. Yes this product really does what it says, gets you the keyword language which Google wants to see in your article to place it at the top. As you say, products rarely do everything you want them to, but in this case i have found very little which it does not do. If you are distracted when writing your articles online then this maybe the option for you. Writing offline and then uploading them could be an answer. I didn’t put the price in but it is $167 in full or six monthly payments of $29 with a 60 day money back guarantee. If you try it – i would say you will keep it. I hope you give it a shot. This really sounds great! I might have to look into it. I’m a beginner who just started about 2 months back and looking for ways to get better. Hi Grace – This program is great for beginners who are starting out in online marketing. 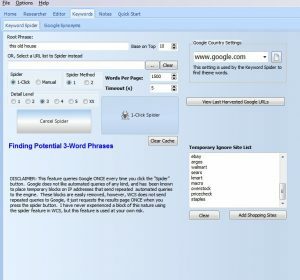 The easy to use interface with keyword spider and editor allows you to find your theme words and write your article with ease. I hope you find that the program would be of use to you. Hi and thanks, this is a really interesting topic. I haven’t really heard of LSI before but after watching the video it does make a lot of sense. I wonder how I would be able to get knowledge about all this LSI information without using the web content studio. What a wonderful tool! I never knew such a tool existed. I love keywords and am always curious as to how they get ranked sometimes, because Google seems to ignore my perfect keywords, although they are word for word, for those that are not even the same but are on the first page. I am excited about the Keyword Spider. I will definitely be adding this page to my favorites to come back to later, because I really want this tool! Thanks a ton for sharing! Hi Reyhana, thanks for taking the time to read about web content studio software. It really does start to change the way you think about the traditional use of keywords. Google is becoming ever more clever and knows that people are using a keyword in their article, so are developing algorithms to find these and not rank them highly, if the quality of the content is not there. With the software you will get access to the topic vocabulary, the words that google wants to see in an expert written article. As such you will be able to write with authority on the subject knowing all of the LSI keywords Google is looking for to rank you highly.